Office of COE send a circular to the Principals of all Affiliated Colleges about the new revaluation procedure. "After the publication of the results by the Office of the Controller of Examinations, the procedure of revaluation is followed. In the revaluation system, the variation in valuation of answer scripts is a common phenomenon. It is a known fact that even if the same examiner values the answer scripts more than once, the variation will be there. When it comes to different examiners, variation is likely to be more. However, if the variation is beyond 15 marks between two examiners, it is considered as abnormal variation. When we analyzed the variation between the first examiner and the revaluing examiner, we found that the variation was very high, which is unacceptable. Also the present system invites criticism from academics as well as from the society. To avoid such variation and criticism, it is necessary to incorporate changes in our revaluation system. A committee was constituted in this regard and it suggested the following revised revaluation procedure which is to be adopted from the November/December 2013 onwards. " 1. Candidates who wish to apply for revaluation should first apply for photocopy of his/her answer script by paying Rs. 300 per script on or before the last date for applying photocopy. 2. After receiving the photocopy, the student can verify the copy for any discrepancy like total mistake and omission in the valuation. 3. If any discrepancy is noticed the same may be brought to the notice of the Controller of Examinations for remedial action. 4. The valuation in the photocopy of the answer script can be verified by the subject expert and if the expert is convinced that the script deserves higher marks than awarded, he/she can recommend for applying revaluation. 5. 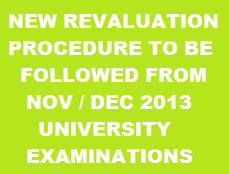 The student can apply for revaluation by paying Rs. 400 towards revaluation fee on or before the last date for applying revaluation. 6. Even after the revaluation, if the student is still not satisfied with the result, he/she can opt for review of his/her answer script by paying the prescribed fee. The review procedure will be intimated along with the revaluation result. 7. There is no change in the existing review procedure. For wrong valuation done by some Faculties, why the students should pay the penalty (Revaluation Fee)??? What is the punishment for the Faculty who have done the wrong valuation? If a Student gets more marks in revaluation,Please refund the Revaluation fee to the students and collect a fine amount from the faculty who have done the wrong valuation? Already students / parents are paying more for their education. Now AU also increasing the revaluation fee is not a good thing for good education. Students also can submit your suggestions in the comment section or our FB Page.